Sarah Conezio and Isaiah Billington were pastry chefs at Baltimore’s Woodberry Kitchen before they “decided to start pushing sugar in a different way” and got into the vinegar business. 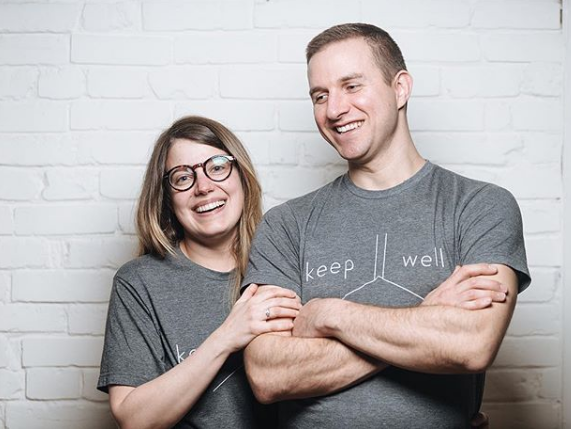 Historically, vinegars started as a way to preserve some of the harvest, and that’s exactly what Keepwell is doing. They often take on a farmer’s excess that might otherwise go to waste and turn it into something that will keep, well, just about forever. They start each batch of vinegar with high quality locally sourced ingredients. The cider-based varieties start with Three Springs apple cider (the same stuff we sell through the fall) that’s fermented into hard cider. Other varieties use their main ingredient as the base for the alcohol, like in the case of the Concord Grape, or the Granny Smith. The named flavor ingredient is added right from the beginning, so that it is fermenting along with the sugars and alcohols. Keepwell’s vinegars have a depth of flavor you don’t get from an infused vinegar, and they are lower in acidity than the standard vinegars available in America. This makes them well-suited to cooking. They’re also wonderful for salad dressings, and some varieties are even great to drink (just add a hint of maple syrup and a few splashes of sparkling water). A rotating cast, depending on seasonal availability — as of August 2018, we have Ramp, Granny Smith, and Sorghum Molasses in stock.